Opel recently introduced the new generation of Insignia marked with Grand Sport addition to the name. 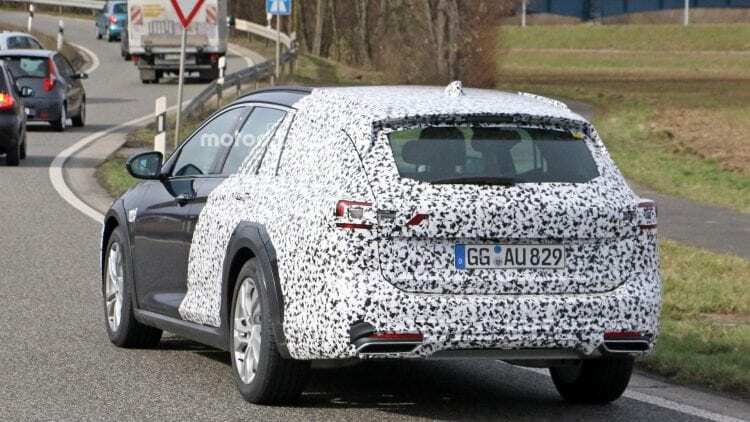 Station wagon, dubbed Sports Tourer has been revealed just a month ago, and already spy photographers caught next version of new Insignia. We are talking here about future 2018 Opel Insignia Country Tourer or more capable version of Sports Tourer which will probably debut at Frankfurt Motor Show in September. Yes, because we already have an off-road variant of current Insignia with the same name. So this would be a replacement for it, intended to continue battling Passat Alltrack and Subaru Outback. Volvo offers the same approach with V60 Cross Country and Audi with A4 Allroad, but that is premium part of the segment with price tag following that idea. Currently, off-road Insignia is priced at $33,5k in Europe, and that will not change significantly, so it will stay substantially cheaper than VW, and for about $7k less it comes in line with Subaru. The base is obviously Sports Tourer model, with some additions to emphasize capability and ruggedness. That means, it is classy and elegant at the front, in Buick sort of manner, with dynamic and handsome rear end. 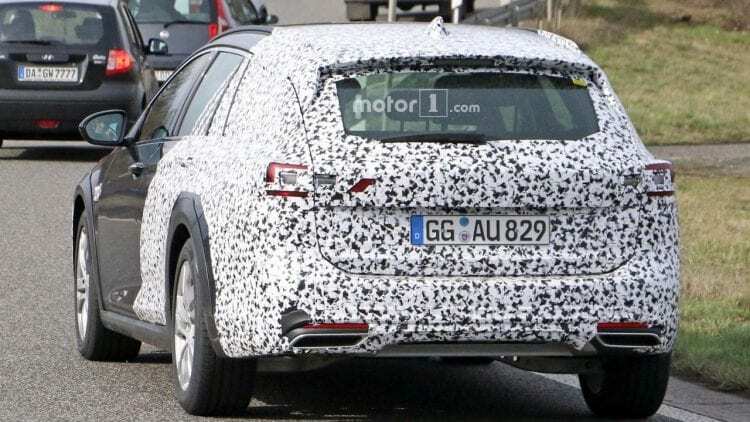 Country Tourer will add plastic moldings, and spy photos openly show side ones, while ones on the front bumper are covered, but we know they are there as well as the skid plate. We already reviewed new Insignia cabin before, and you already know that it is Opel’s step to deeper elegance followed by simplicity. The same approach used Peugeot when it introduced 508 model, while we think Germans did it better by orientating dash towards the driver adding some flair to it. As the estate, this version will feature large boot, from 18 cu ft to enormous 58 cu ft, while rear bench can fall in 40:20:40 configuration. The main thing with this version, apart from SUV-ish styling bits, would be all-wheel drive system. AWD will come as standard, while other versions start with FWD, and coupled that with increased ground clearance of 0.7 inches and we have some all weather capability. Don’t expect too much, though, you are not getting that with rivals also, as this is AWD, not the 4WD system. Country Tourer will use Twinster AWD system that uses torque vectoring to ensures better grip, so it primarily improves cornering, capability for bad weather in a city environment, but serious off-roading is out of its league. The mentioned system is special in a way, as it doesn’t use limited slip differential most common in AWD systems, it actually doesn’t use rear differential at all. It uses a twin-clutch system which distributes torque independently to each rear wheel up to 100 percent, so torque vectoring, in this case, doesn’t even include brakes either. The same system allowed the creation of “drift mode” button in Focus RS, but before you go berserk, don’t expect the same button here, this is not that type of the game. We’ll inform you further on 2018 Opel Insignia Country Tourer, as soon as more information becomes available.